Still in Guatemala, so i just made this up based on what I could find. There is this really nice little grocery store on our block (a safe distance for me to walk alone) and I was struck by how cheap basil was – 18 Quetzals for a big, healthy bunch (about $2.30). It was also the first time I had seen a good looking baguette in a grocery store here (VERY exciting). So the crostini just kind of happened. 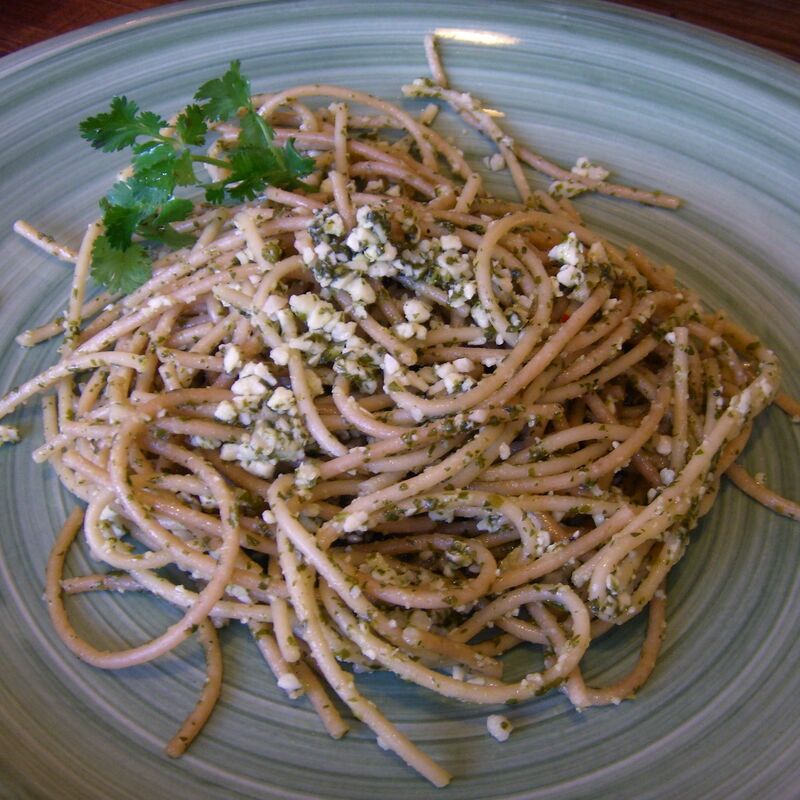 This pesto recipe is the result of working with extremely limited kitchen tools and supplies, but came out really well because the basil was so good. The radish adds a nice crunch and pepper flavor. toast the almonds on the stove. medium to medium-high heat for 5-10 minutes. stir occasionally so as not to burn them! pulse toasted almonds in food processor until they are finely chopped. add whole garlic and process until the garlic is all chopped up. Then add oil then basil and process until the basil is all chopped. stir in cheese and salt and pepper to taste. Set the oven to broiler. Slice baguette into 1/4″ to 3/8″ slices and arrange as many as you can fit on a baking sheet. Our oven is so tiny that I did batches on the little pan that comes in your toaster-oven. Yeah. Brush with evoo. Since of course I didn’t have a brush, I dipped a fork in a glass of evoo and spread that over the slices. You really don’t want too much olive oil on the bread, just enough to make them golden. Toast in the oven for about 4 minutes. * Optional – slice a clove of garlic in half and rub on the toasts, either before baking or right after they come out. This is good if you like garlic as much as I do. 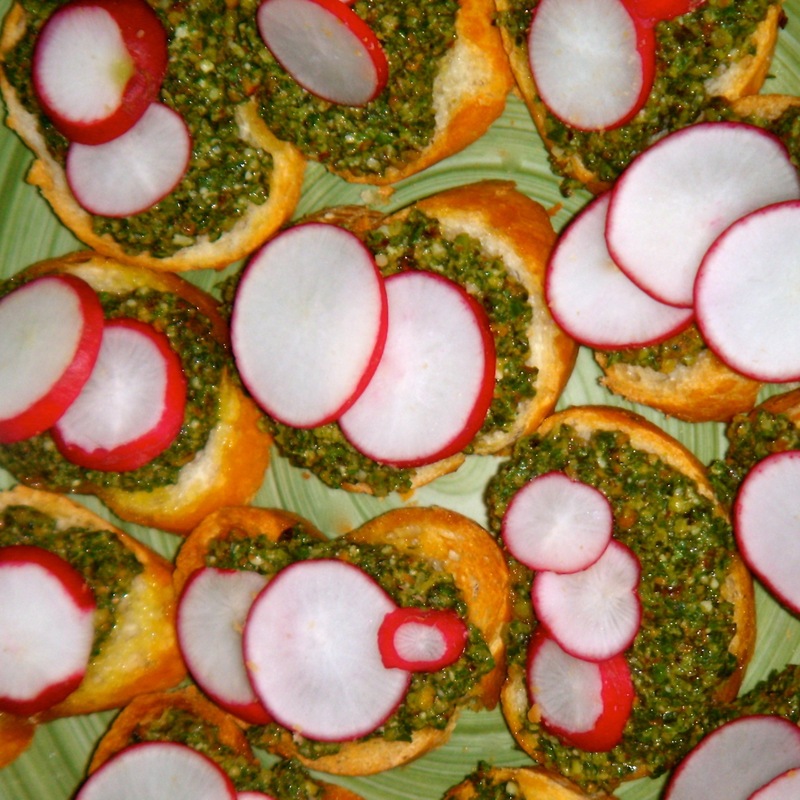 spread a tablespoon of pesto on each toast, then top with a few radish slices. Done. In a big Tupperware type container (something you can mix then put a lid on to store), mix the wheat germ, flax, and oats (I add a teaspoon of cinnamon here as well). Mix in remaining ingredients, adding extra oats if you want. 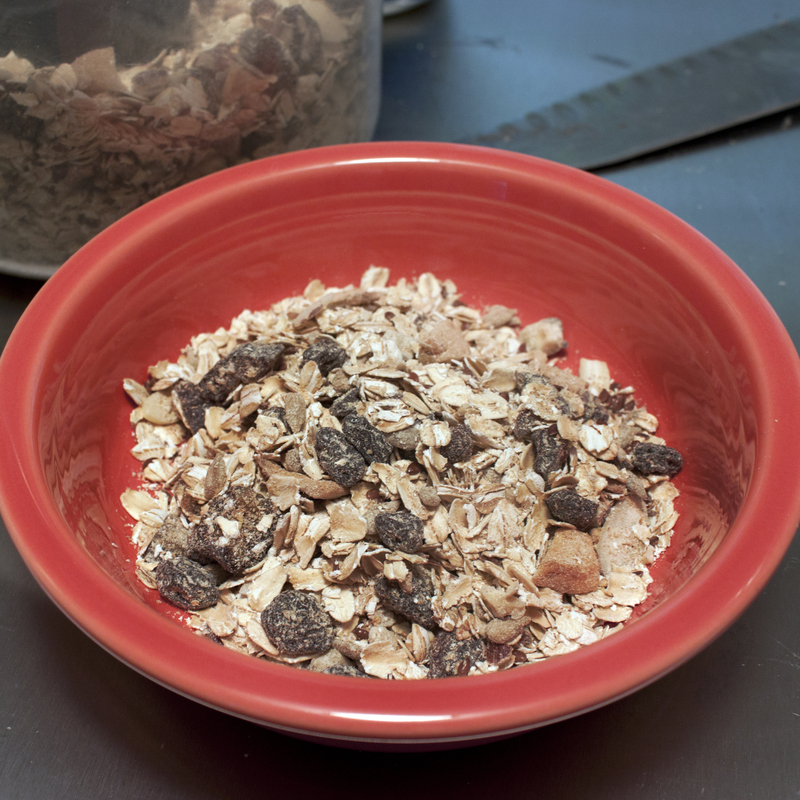 Our 2/3 C measure lives in the muesli for scooping in the morning and replenishing every couple of weeks!